Alice Treemont has given up hope of meeting the right man and falling in love. 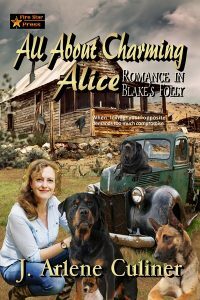 Living in Blake’s Folly, a semi-ghost town of rusting cars, old trailers, clapboard shacks and thirsty weeds, she spends her time cooking vegetarian meals, rescuing unwanted dogs, and protecting the most unloved creatures on earth: snakes. What man would share those interests? Jace Constant is in Nevada, doing research for his new book, but he won’t be staying long. As far as he’s concerned, Blake’s Folly is hell on earth. He’s disgusted by desert dust on his fine Italian shoes, and dog hair on his cashmere sweaters. As for snakes, he doesn’t only despise them: he’s terrified by them. He can hardly wait to get back to Chicago’s elegant women, fine dining, and contemporary art exhibitions. In need of juicy gossip, the other 52 residents of Blake's Folly have decided Alice has been alone for long enough. The attraction between her and Jace is obvious, so why worry about essential differences? If you trust in love, solutions do appear. But don’t those solutions call for too many compromises, too much self-sacrifice?